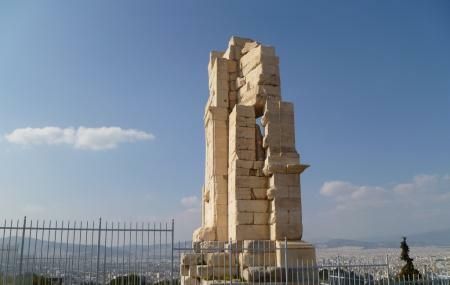 The Monument of Philopappos is located at the Philopappos Hill and commemorates the Roman consul and senator Gaius Julius Antiochus Epiphanes Philopappos. What made him special enough to be put into stone was that he was a powerful aristocrat and friend of the Roman emperor Trajan, who stayed for a very long time in Athens due to his admiration for the city. During his stay in the city, he was seen as the benefactor as well as the connoisseur of arts as he often sponsored theater plays. It was only after his death that the citizens of Athens built a marble tomb in his memory. Completed in 119 AD, this monument stands tall with its twelve meters’ heightand a strategic location that staged it at a high position. Although in ruins today, this site still unveils some relics of the statue. How popular is Monument Of Philopappos? People normally club together Museum Of Greek Gastronomy and Athens First Cemetery while planning their visit to Monument Of Philopappos. Had a good walk in the park, provided very good views to the Acropolis. However, I read later that this might be a hot spot for robberies because it is quite isolated within the park and I didn't see many people at about 1pm on a Wednesday end of March (not tourist season yet). So, better be safe than sorry and be careful. After you have seen the Acropolis of Athens, take one of the cobbled walk ways that lead into this hill. It is a small but really picturesque trek. I will recommend to go up here later in the evening to catch some of the most breath taking views. You can see the Acropolis on end and then the setting sun and the see to the west. The little hillocks are pretty and make for a wonderful walk. Definite must do. You should definitely visit the Monument of Philopappos. The views are breathtaking, awesome, and provides stunning pictures. The small hike to the top will provide the feeling of leaving the city, getting into nature, and much needed relaxation. Getting to the monument is easy and peaceful. The hike will take you through trees, brush, and provide a break from the city. The monument itself is stunning, especially knowing the age of the monument. I enjoyed my time so much, I visited the Monument of Philopappos two times. During both of my visits, there weren’t many visitors. The first time, I felt like I was the only person up there. I highly suggest visiting this monument. Bring some water, beers, snacks, and enjoy 2 - 3 hours out of the city. Great place with breathtaking view for almost whole Athens and also great view on Acropolis. Monument itself is also pretty amazing. Hill is not very high, and to climb it is easy and there are a lot of pavements and benches. Unfortunately there are some camp of bums and other homeless folks with dogs, So be careful not to go not by road. You should definitely go there, located no far away from the entrance to acropolis, offers breathtaking view of acropolis, and athens itself. I have been there many times at night and it is absolutely safe place.